The SEQARTKIDS program creates positive whole-school change and has been helping NYC public school children achieve great results for 25+ years. 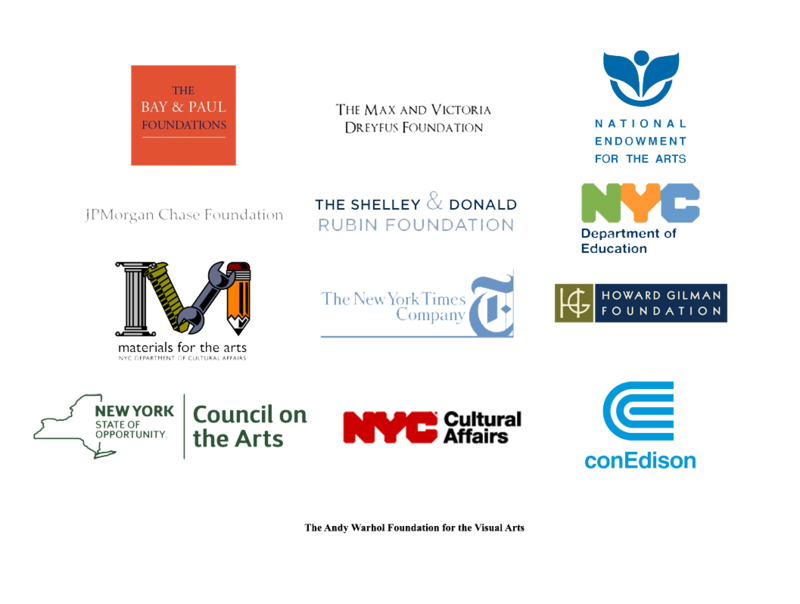 Franklin Furnace wishes to thank the public, corporate and foundation supporters of SEQARTKIDS since its inception in 1985: The Milton and Sally Avery Arts Foundation; The Bay and Paul Foundations; The Frances and Benjamin Benenson Foundation; Consolidated Edison Company of New York; The Cowles Charitable Trust; Chemical Bank; The Max and Victoria Dreyfus Foundation; The Howard Gilman Foundation; Independence Community Foundation; JPMorgan Chase Foundation; The Elbert Lenrow Fund; The New-Land Foundation; Sara & David Perlmutter; The Shelley and Donald Rubin Foundation; The Andy Warhol Foundation for the Visual Arts, Inc.; The Norman and Rosita Winston Foundation, Inc.; The National Endowment for the Arts; The New York Times Company Foundation; New York City Department of Cultural Affairs, in partnership with the City Council, and Materials for the Arts; New York City Department of Education and Principal Lena Barbara of PS20 Clinton Hill School, Principal Franca Conti of PS217 Colonel David Marcus School, Principal Rena Goudelias of PS185 Walter J. Kassenbrock Elementary School, all in Brooklyn; and The New York State Council on the Arts with the support of Governor Andrew Cuomo and the New York State Legislature. If you would like to support SEQARTSKIDS, please contact us. Thank you!